A clear glass storefront surrounded by a paneled facade" and, within the store, an oblong table with stools...set below video screens flush mounted on the back wall. The trademarks were filed in 2010, and were granted this month on January 22 by the USPTO. It's no secrete that Apple's success with showcasing its products in brightly lit, convenient interior stores attracted the attention of other big time tech companies. Microsoft and Samsung were both known to have copied much of Apple's retail store design theme and minimalist environment layout of product placements in recent years. 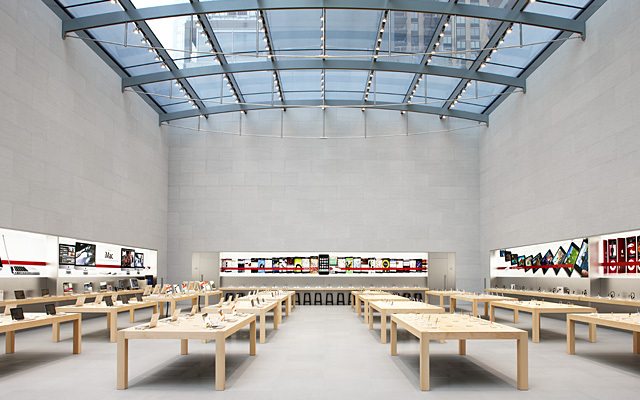 In 2003, Apple was granted a design patent for the German-engineered floating glass staircases many of its retail stores feature.